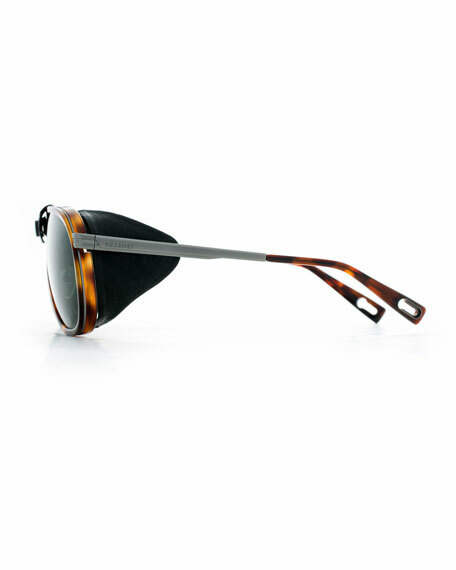 Vuarnet "Glacier XL" stainless steel/acetate sunglasses. Removable side case in natural leather with magnetic fixing to the arms. Natural leather cord with detachable steel fastening system. Aviator frames with removable, leather side case and leather cord. Grey Polarized lenses with antireflective coating. Frey & Winkler nose pads for maximum hold. 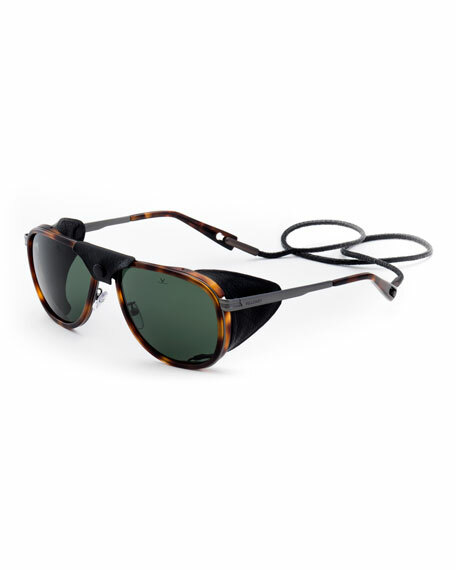 EXCLUSIVELY AT NEIMAN MARCUS Garrett Leight "Linnie 51" sunglasses. Square curved cellulose acetate and stainless steel frames. Lens/bridge (in mm): 51-19. CR-39® lenses. Keyhole nose bridge. T-details at temple. Stainless steel hinges and screws. 100% UV protection. Imported. Garrett Leight "Brooks" sunglasses. Square cured cellulose acetate frames. Green polarized mineral glass lenses. Keyhole nose bridge. Double-pin details at temple. Stainless steel hinges and screws. Dimensions (in mm): 47-137-146. 100% UV protection. Imported. 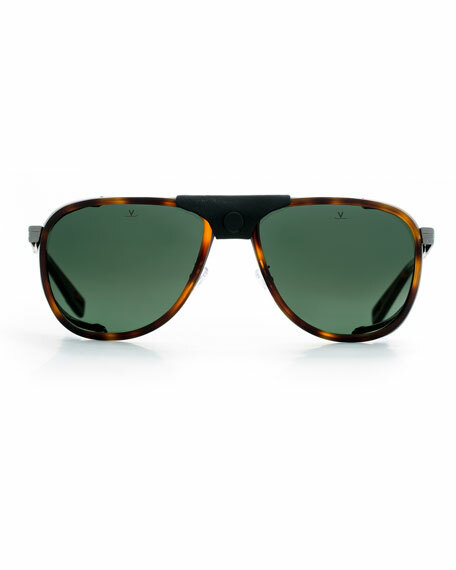 Garrett Leight "Calabar 49" square sunglasses. Square cured cellulose acetate frames. Green polarized mineral glass lenses. Keyhole nose bridge. Double-pin details at temple. Stainless steel hinges and screws. Dimensions (in mm): 47-148-145. 100% UV protection. Imported.